Celebrate Hello Kitty's 40th Anniversary event at the first ever official Hello Kitty Convention in the world! Hello Kitty Con 2014 is a global gathering of fans and friends to celebrate all things Hello Kitty. Taking place at The Geffen Contemporary at MOCA (Museum of Contemporary Art) in Downtown LA's Little Tokyo, Hello Kitty Con 2014 will offer interactive experiences and events for fans and friends of all ages, including activities, art, exhibits, exclusives, workshops, lectures, panels, sneak peeks, tattoos, food, fun, and many more surprises! 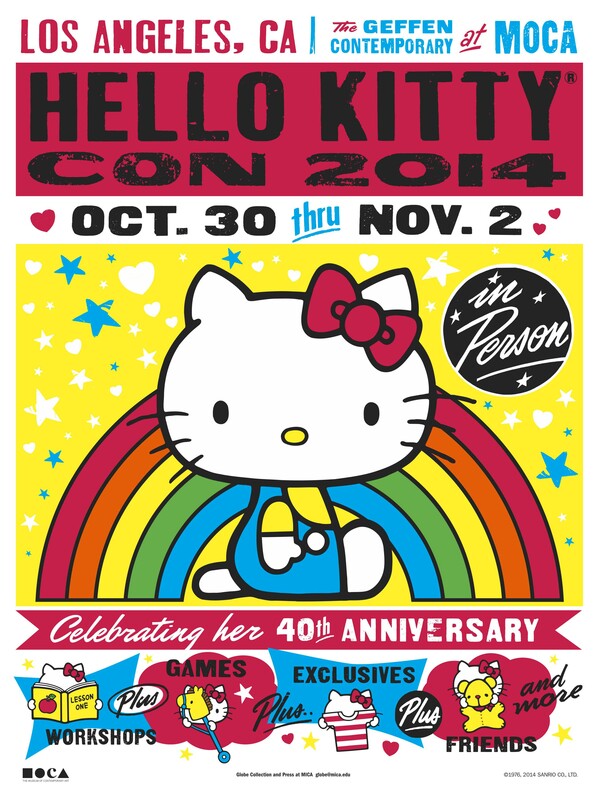 Join Hello Kitty and your friends at Hello Kitty Con 2014. As Hello Kitty always says, "You can never have too many friends!" Celebrate Hello Kitty's 40th anniversary at the first ever Hello Kitty convention in the world! Please bring your email confirmation and ID to pick up your badge at the Geffen Building at the Museum of Contemporary Art, 152 N Central Ave, Los Angeles, CA.